While the effective height of the proposed tower to rise up to 250 feet in height upon the City College of San Francisco site at 33 Gough Street hasn’t changed (too much), two stories have been added for a total of twenty-five (25) and the tower’s floor plates have been widened from 8,000 to 10,000 square feet by David Baker Architects. As such, the proposed development would now yield a total of 518 residential units, an increase of nearly 20 percent from the 433 as originally envisioned and a mix of 188 studios, 198 one-bedrooms, 78 twos and 54 threes, over 5,600 square feet of ground floor retail space and parking for 130 cars (a reduction of over 100 spaces) and 205 bikes. 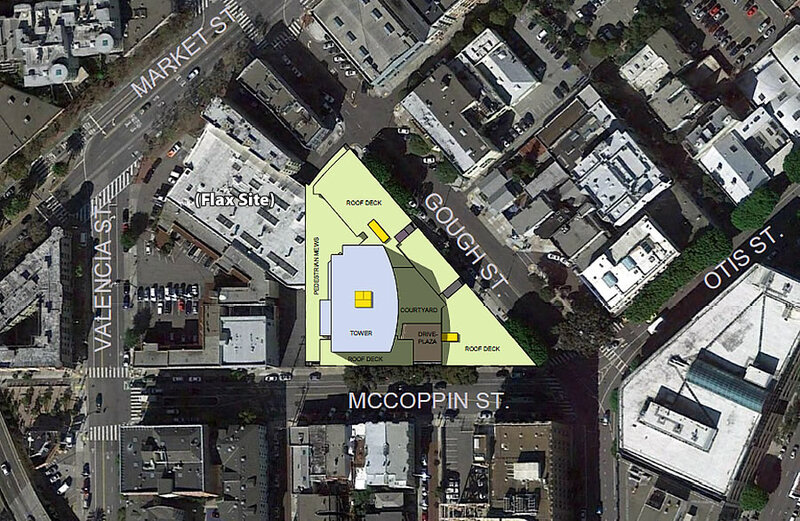 A public mews would still wrap around the proposed development, connecting McCoppin and Gough. And once again, while the City College site is currently only zoned for Public use and development up to 85 feet in height, the parcel is proposed to be rezoned per the City’s Hub District Plan. We’ll keep you posted and plugged-in. great plan, great looking building and great density. lets do it. “Great looking building”? How can you tell from the massing diagram? I like the massing and street level UX. It also leaves viable space for replacing the lower bits with new towers if zoning ever allows. Great! Next up on that block – The Travelodge! OK, more homes in the Market Street Hub neighborhood is good. I can get behind that. The Hub really needs more parks and open space in the plans though. It’s the *one* part of SF I’ll say that about… high density of potential park users! Doesn’t the City own its office building at 1650 Mission and aren’t they planning to vacate when the new office at the Goodwill site opens? I’d like to see plans to demolish that building, dedicate the southern 2/3 of the lot for a public park (with a pedestrian connection from Gough/Otis/McCoppin through to Mission), and sell off the northern 1/3 zoned for another high-rise. That would vastly improve walkability by breaking up a big block; provide needed open space; and the upzoning of the northern part of the parcel would mean the City would still get decent revenue from the site. I live in NEMA so very much in the “Hub” area and I agree with you that there is no park that is currently inviting to the area…but hilariously, there IS a huge park in the area. Civic Center Plaza. There are grass areas for days for reading, picnicking, etc. The problem of course is that it is overrun with drugs and crime and loitering and most avoid it (we won’t even walk our dogs there because of the needles, and we can see it from our place! ), but if it WASN’T, that would be more than enough park space. 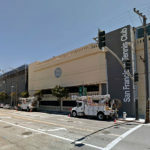 I am cautiously optimistic that the Helen Diller playgrounds opening on Valentine’s Day, and the Bi-Rite cafe opening this summer, will be enough to start to activate the space, and the increased density by infill projects that are nearing completion (like 150 Van Ness) might also help with that. If we can activate it to the point where benches can finally be re-installed, that’s enough park space. I’d love to see an activated and welcoming Civic Center Plaza with seating. That said, it’s a 15 minute walk from this site, and to me, that’s a totally different neighborhood. Considering how the Hub is going so dense and tall (which I welcome! ), a separate “Otis Park” would be well-used too. Isn’t there some sort of park proposed for that big project at Market and Brady? I never hear ANYTHING about that project and who knows if it’s even being built anymore, but I seem to remember open space being a part of that. To SocketSite, can’t believe I missed that, I usually try to stay up on everything in my hood. Muchas gracias! Also welcome but real small and somehow even though the Hub Plan said it would be a park, it got demoted to a POPOS, which might be closed certain hours, ban skateboarding, have private security hovering over you etc, like the really disappointing Trinity Place POPOS which is downright fortress-like. why do we want more parks when they are immediately filled with homeless? More parks and open space in this immediate will only act as a collection spot for the homeless. Look what happened to the mini park at the end of McCoppin. A lot of money was put into refurbishing it. Now it is closed. You are reading about a project to bring 800 new residents to the neighborhood. Nearby towers will bring thousands more. And it doesn’t occur to you that the neighborhood in five to ten years will be completely different? Have a little imagination. McCoppin Hub today is nestled between a U-Haul rental place, an onramp and a furniture store in a low-density neighborhood. Apples and oranges. That “pedestrian mews” (it’s a f’ing walkway) is a horrible idea and will be filled with human [waste] every day for as long as it exists. Take a walk around Brady, Stevenson, or god help you, Colton, and see how many steps it takes for you to come across the next pile of literal sh*t on the ground. Civic center Plaza is about 7 minutes away by foot. There’s a skatepark right down the street, and as mentioned above, the park on McCoppin – even though they went as far as having lunchtime string quartet performances – was taken over by zombies immediately and CONTINUES to be a site of seediness even though it’s long been fenced off. Point being, this area is not ready for more parks, and stop [spouting] off about micro-neighborhoods. Yes, let’s definitely not provide any public bathrooms either. The homeless should hold it in until if and when they are housed. Thank you! The lack of public bathrooms is infuriating. It’s like SF will do anything it can to maintain as much sh*t on the ground as possible. As a neighbor, BUILD IT! Love the height. Such a gross weird hellscape of a block that I’d love to see flushed out. 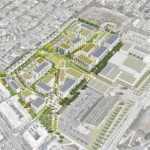 So one building on maybe an acre of land is going to create half as many units as the the whole 14 acre “Massive” Balboa Reservoir Redevelopment project? How does that make any sense for a City and region so starved of new housing stock? As a neighbor, the sunlight in this neighborhood is going to diminish dramatically if any more buildings that are this tall go up. I don’t like the idea of it being darker during the day, Also, how did we increase the number of residential units, and simultaneously decrease the number of parking spaces by 100? Increasing density without some increase in parking availability does not make sense. People that live here will have people that come by car to visit. It is a trend in all of the new builds that they keep reducing parking spaces. What provisions have been made for these developers and property managers to contribute to the safety and security of the area around the buildings? They will make hundreds of millions of dollars but make no contribution to the safety, security and cleanliness of the community makes no sense to me. Just as an aside, if people that don’t need or qualify for a rent controlled apartment would vacate, there would be more affordable housing in the city.